Skype WiFi (formerly known as Skype Access) is coming to iOS. We've just launched a new iOS application that's free to download from Apple's App store. 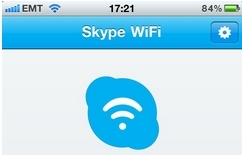 With the new Skype WiFi app, you can go online on your iPhone, iPad or iPod Touch (running iOS 4.1 or above with multitasking) at over 1 million WiFi hotspots around the world, including hotels, airports, train stations, convention centres, bars and restaurants. And withSkype Credit you only pay for the minutes you use. So, there's no need to buy an hour or day WiFi voucher if you're only looking to check your email or make a quick Skype call. Skype WiFi is great for travellers all over the world: It's a must-have app, for your iPhone or iPad whether you're on a business trip or enjoying holidays abroad. Skype WiFi offers you a cost-effective and easy way to get online with an iPod Touch, iPhone or iPad. Paying on a per-minute basis for WiFi Internet access is great when you're abroad as you can avoid data roaming charges when you update Facebook, send a tweet, make a Skype call or upload photos. WiFi access prices through Skype start from US$ 0.06/4p/€0,05 (inclusive of VAT) per minute* and you will only be charged for the minutes you are connected. There are no limits on the amount of data you can upload or download. • Go to the App Store and download the Skype WiFi app• Open the Skype WiFi app for iPhone, iPod Touch or iPad• Sign in with your Skype account details or visit Skype.com to create a new account• Tap Go Online and you're online!